Spider Plants (Chlorophytum comosum) are herbaceous perennial belonging to the Liliaceae family. They are native to South America, and grow in USDA hardiness zones 9B-11. 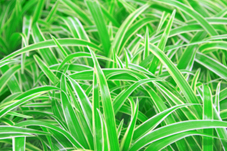 Spider Plants (also known as Airplane Plants and Ribbon Plants) are hardy, versatile plants that can be displayed outside in containers, or planted as ground cover. They are popular houseplants because they are easy to care for and propagate. These plants can be displayed on a pedestal in an entryway, or planted in a hanging basket to show off their cascading plantlets. The curved, strap-shaped leaves of the Chlorophytum comosum are 8 to 16 inches in length, and are solid green in color, or green with a white or yellow stripe running down the center. Some variegated spider plant varieties are green at the center, with white at the edges. The small white, star-shaped flowers appear at the end of arching shoots, which later develop plantlets at the tip. This plant can grow 2 to 4 feet in diameter, and one foot in height. During spring and summer months, keep soil moist without over saturating. During fall and winter months, since water will not evaporate rapidly, you can reduce the frequency of watering. When watering container plants, water should run out of the drainage hole at the bottom of the container. Do not allow this plant to sit in standing water – this could cause root rot. Flouridated water can cause the tips of the leaves to burn. If this becomes a problem, consider collecting rain water or buying distilled water from the store. Chlorophytum comosum thrive in partial to full shade. If leaves begin to turn brown, the plant could be receiving too much sun (this could also be a sign of underwatering). Try moving the plant to a shadier location. Ideal temperature is 65 to 80° F. If indoors, avoid placing plant near hot or cold drafts that could cause extreme fluctuations in temperature. Fertilize these plants with a soluble houseplant fertilizer. Fertilize every two to three months. Refer to the manufacturer's recommendations to determine the appropriate amount of fertilizer to use. 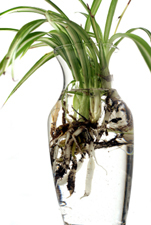 If your spider plant outgrows its container, it will become root bound and might damage the container. You have two choices: 1) You can repot the entire plant in a larger container, or 2) Divide the plant, and replant each section in separate containers. Divide the parent plant. Repot the divided sections into containers, or plant in the ground. Cut off one of the plantlets growing at the end of the arching shoots. Place it in a glass of water. When the plantlet has grown a healthy root system, it can be potted or planted in the ground. Leave plantlet attached to the parent plant. Place a container filled with commercial potting soil next to the parent plant. Place the plantlet in the pot, and hold it in place with a hairpin or bent paperclip. In approximately six week, roots will become established. When roots are well established, the plantlet can be cut from the stem.